The main requirement of Assignment 2 is to produce approximately 12 photographs that are made on, or explore the idea of a journey. I examined this as both a journey along a path, but also a journey down memory lane. 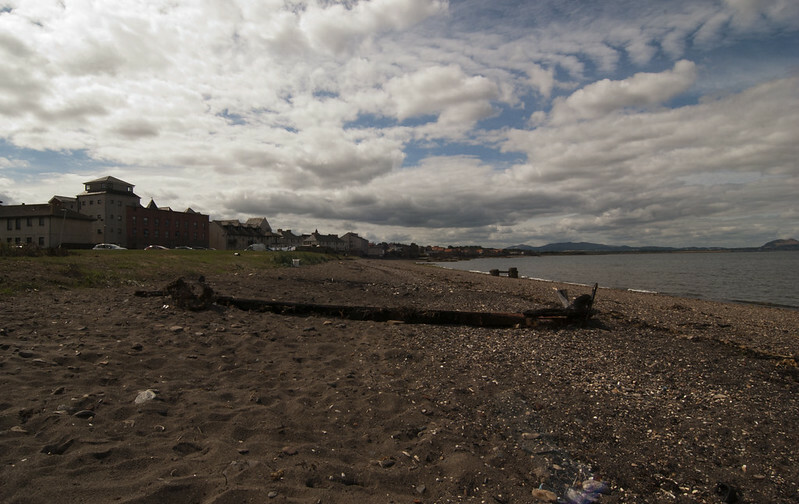 The area I was photographing is a small part of what is now the “John Muir Way” a section of beach where I spent some of my childhood. It is a post-industrial area where local history is fighting to stay alive. 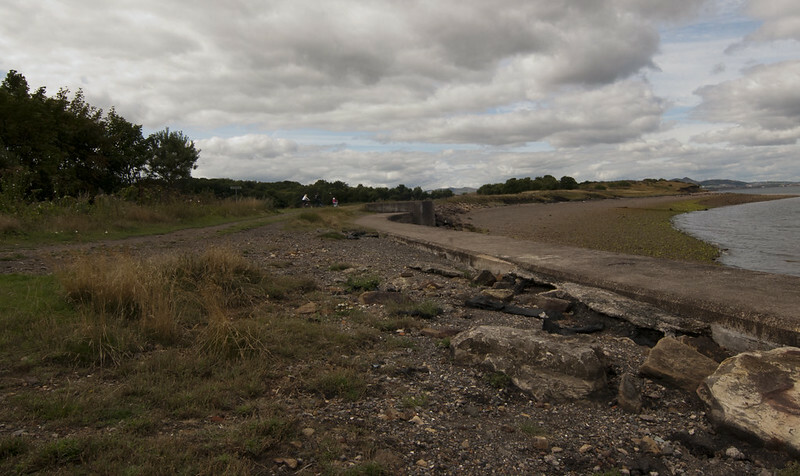 The journey took place along a concrete pathway which was laid down over the metal and asbestos pipes which carried the ash from the coal power station to a lagoon area. These ashes were used to create a piece of land recovered from the sea. The journey passes the disused sites of different industries now lost to the place. I started at the edge of the town and worked back along the walk towards the other edge of the town where the power station once stood, passing history, pollution, the remains of the fishing industry, salt panning and the use of the land by the local population along the way. The main techniques I wanted to use were colour, a wide-angle lens and the decision to keep the main part of the horizon in the upper third of the frame. This meant at times using walls and buildings as the lead part of the horizon. While the point of view was limited to a certain focal length and depth I feel that this worked as the eye is drawn along the structure out into the far horizon. I tried to keep the images off centre to bring in the concept of moving the viewer’s head from side to side as if they were looking while walking. The project is led by the movement of the images through the viewer’s point of view rather than the artist forcing a fixed stance, especially in a wide lens where the main part of the subject is usually pushed in the centre of the image due to the structure of the lens and the heavy centre point that it creates, similar to how ‘Wyle’ presents the walls and fences in his work ‘Maze’ ‘Wyle.D 2010’. I was also influenced by the work of Raymond Depardon in ‘Glasgow’ ‘Depardon and Boyd. 2016’ where he captured both the landscape and the feeling of Glasgow in the 1980s within each scene. While working in colour I wanted to still keep to Ansel Adams zones so I tried where possible to capture the widest range of contrast while not blowing out the whites and destroying in the darks. 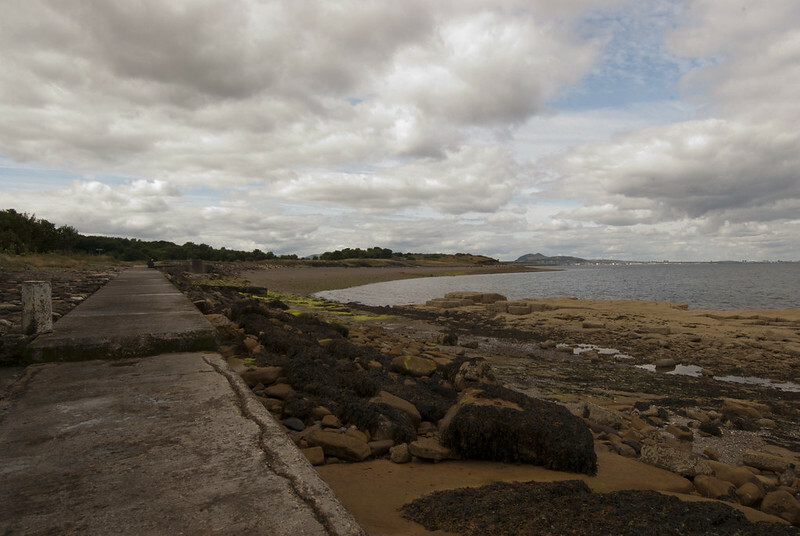 The edge of town and the John Muir walk. Here at the edge of the town, the path is signposted as part of the John Muir Walk which takes walkers along across country from the west coast to the east coast of Scotland. 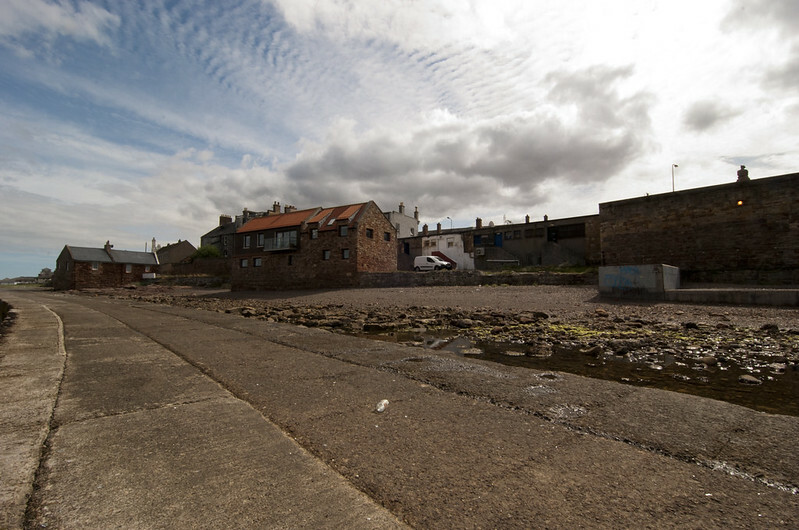 This small section of the walk continues round the coast and carries right along to the town of Dunbar. 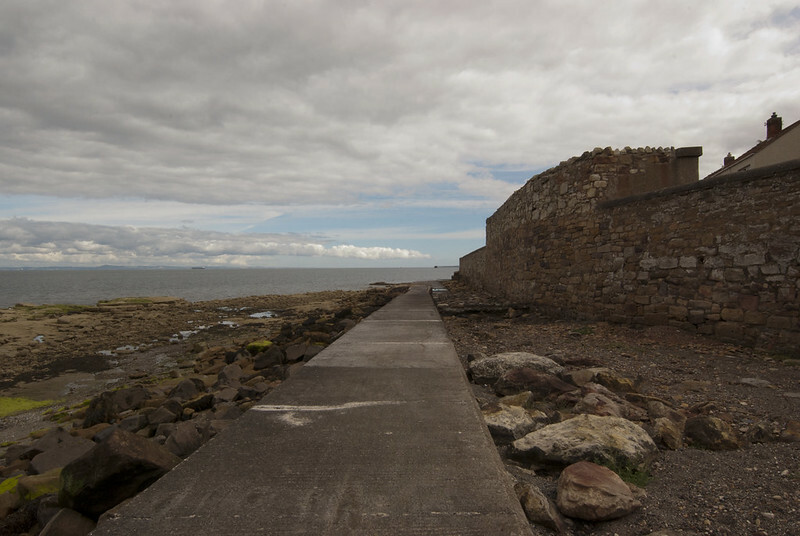 Here walkers step onto the concrete path and over pipes no longer in use, as they start along between the sea and the bordering town of Prestonpans. Looking back the way, over the years more pipes were laid down and covered in concrete as burners of the coal fired power station were taken out of service and the station started its own journey towards final shutdown and decommissioning. The concrete for the main part is uneven, rusting and slowly falling into disrepair. The responsibility for the maintenance for the walkway is disputed and as the dispute goes on the path falls away to the waves. Water quality in areas like this was not high on the list of important subjects. Raw sewage was pumped directly into the sea from sluices and pumps. 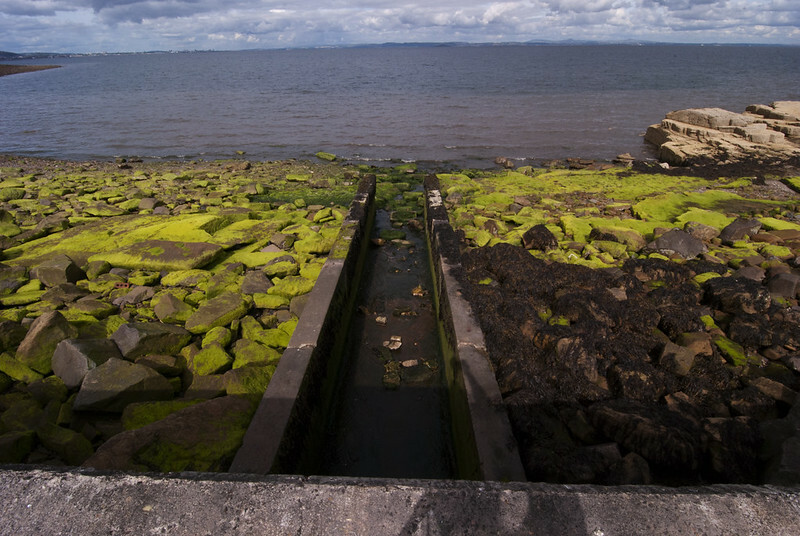 When the local authority built two new housing schemes in the 1950s to take some of the overflow from the relocation of Glasgow’s slum tenants and relocate them in other communities, the pipes and sluices were expanded to carry the effluent straight into the sea where I like a lot of the towns children swam. The sluices are no longer in use and now sit disregarded, another viewpoint for the houses built right on the other side of the path. Every available piece of land which is no longer dedicated to ongoing industry, jobs or shopping has been torn down and built on. 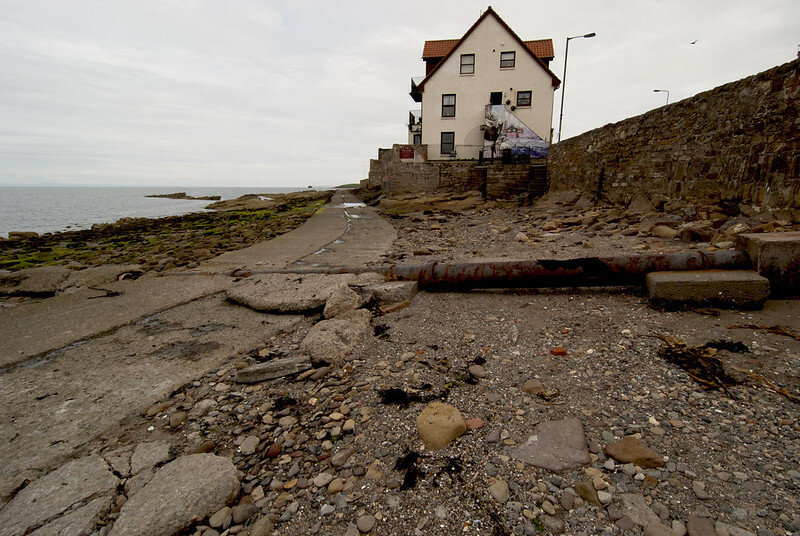 Modern houses barricaded behind high walls to prevent them being hit by waves and storms. This was green hills and a play area when I was a child. Unlike other parts of the walk in surrounding local town communities, there has not been a sense of urgency in cleaning the beaches and preventing pollution in this area. Walkers and tourists pass by, unbothered at the mess dumped by uncaring locals. Where the pottery stood in the 1800s. The location of the pottery had been forgotten until a local builder contracted to build houses started finding pottery shards in the rubble. Work was stopped and the remains examined. It is not known how soon after the last potter died that the original building was torn down, but even now shards can be found along the coastline. 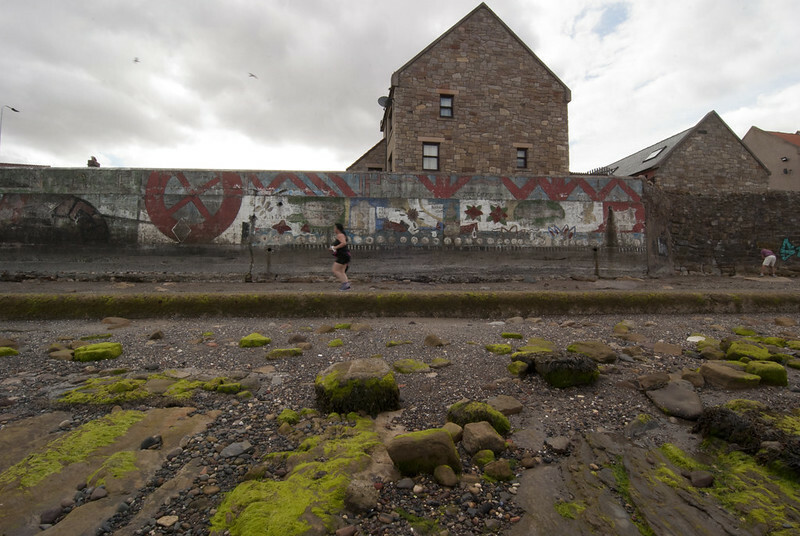 There was a brief attempt to create a resurgence in the history of the town as part of a local diaspora studies project but the murals erected at that time have quickly been left to fend for themselves against the elements. Another example of the human waste pipes which used to carry effluent straight into the sea where people used to fish and swim. Now the pipes are left to crack and fall into the sea in their own time. Mixed among the brickwork are the doors, hatches and entryways which were formally used to access the beach for fishing or for access to the salt pans. Once a port of call. What used to be part of the local harbour protection has been cut off from the walkway, the rocks are now used by the occasional rock pooler or as somewhere to sit and drink during warmer weather. There used to be twin cottages with boat stores beneath, so that the local fisherman could get out and gather fish for sale locally. The property was bought over, and extensively renovated on television. Meanwhile the backs of the shops continue to deteriorate as they pass from tenant to tenant as businesses start up and close down. During the 1960s, there was an attempt to bring back civic pride in the area. A statue was commissioned to represent the three main industries of the town; fishing, mining and salt panning. This was all built around a walkway down onto the coast to encourage people to look out over the water and see a better future. Now it sits, crumbling at the edges, vandalised. The statue ignored while vandalism and graffiti cover the walls with new ‘civic art’. Here the walkway disappears underground as the land has been pushed down on the coast to allow more house building. Before the houses were built, there was a row of wooden sheds where the fishermen sat and tended their nets. They would tell tall tales of danger in high seas to bright eyed children who stopped to watch them (myself included). I can remember weather beaten hands and faces, woollen hats and the smell of the sea. The bones of Reaper II. Recently a boat ran aground during the night. After an attempt to tow the boat back out to sea which resulted in the bow being damaged, the boat was beached and for a short time the owner tried to undertake repairs. After some reported friction with locals and the police, the owner decided to torch the boat and leave. 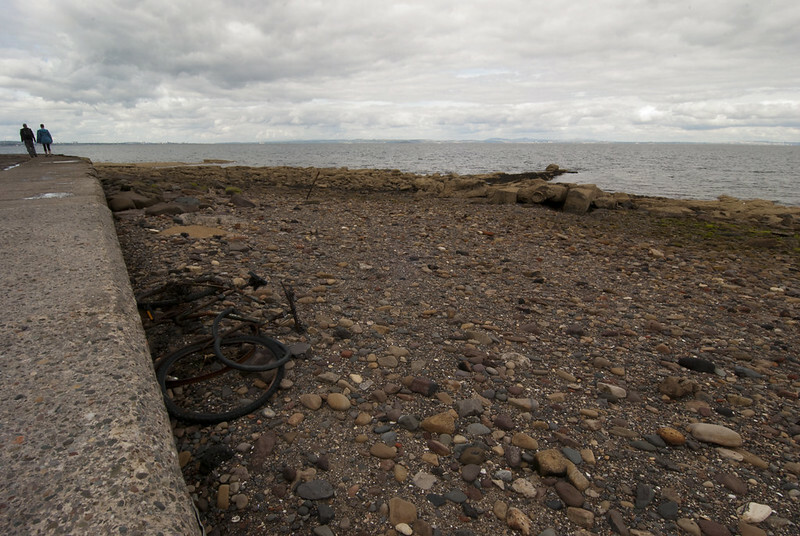 The keel-line and some metal remains are all that is left here at the other edge of town. Here is a PDF of all the images taken for this assignment in contact sheet form. Landscape-Assignment2-ContactSheets . The images chosen and shown above I believe to be the images most expressive of my concept and gives the viewer a journey along the same path. There were a number of challenges to overcome. First of all the path is not built with mobility in mind and so I had to leave the path at some points and rejoin at others backtracking where I could. Technical challenges included limiting myself to one lens where the focal depth was 11 to 16 mm; this challenged me as I had to think hard about where I could point the lens and what I was capturing. I deliberately attempted to keep the horizon in the top third of the lens which caused problems in framing a large number of the shots. I had to revisit the locales twice as the first time the lens developed a problem and a number of images were marked with a blue bloom in the middle of the frame. Communication challenges included the framing of the images and trying to tell the correct story within the framework of a journey. I wanted to keep the images simple but at the same time reflect the psychogeography of the locale. Can I communicate the issues within the town as it struggles with growth and the loss of history both in the destruction of the landscape to build houses but in the rise and fall in interest in the history of the area. 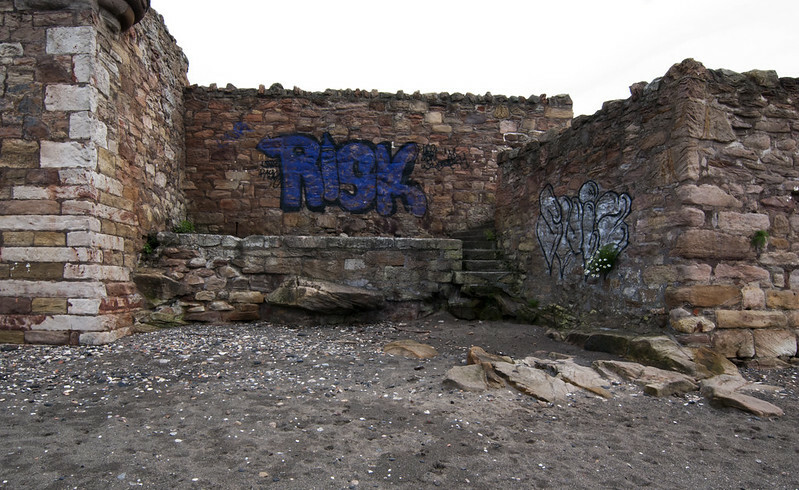 The images that I chose represented the edge land of Prestonpans, as it grows outwards, it rolls over what is underneath, the industries are gone, blocked up and in with bricks formerly produced in the town. 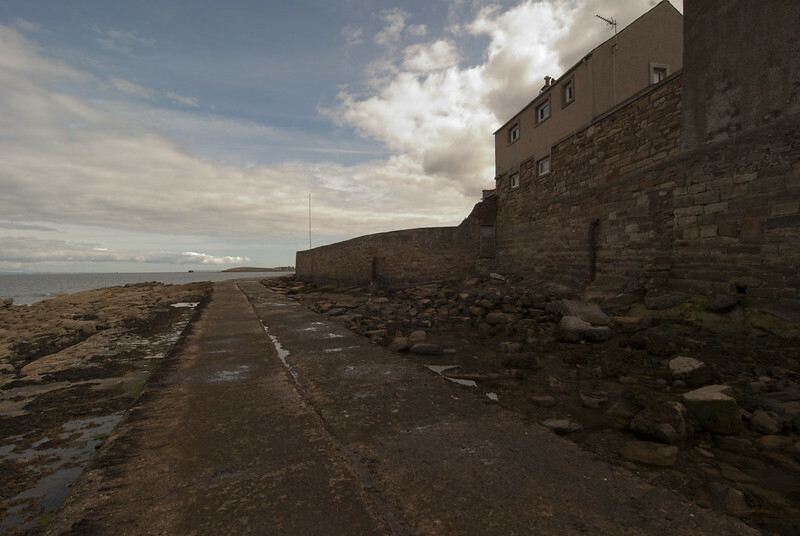 As the sea washes away the harbours, fishing beds and remains, the town washes away its past by pushing it to the edge and forgetting about it. I wanted to represent the walker on the John Muir walk and what they see both of the walk and what they pass; do they ignore the area in the rush to get to better views or do they examine and think about what is being lost. Scottish Natural Heritage. 2018. The John Muir Way. [ONLINE] Available at: http://johnmuirway.org/route. [Accessed 24 August 2018]. 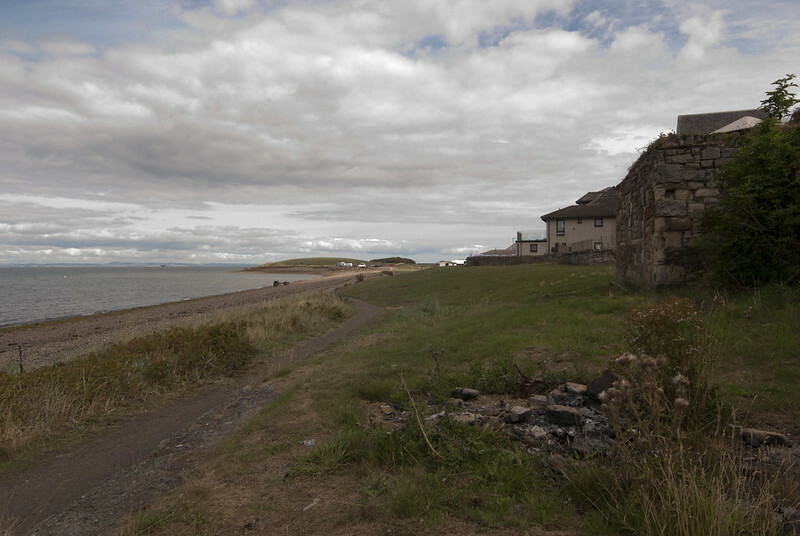 PrestounGrange. 2018. Prestongrange online. [ONLINE] Available at: http://www.prestoungrange.org. [Accessed 21 August 2018]. PrestounGrange. 2018. Prestongrange online. [ONLINE] Available at: http://www.prestoungrange.org/core-files/archive/scottish_pottery.pdf. [Accessed 24 August 2018]. Depardon, R., 2016. Glasgow. Editions du Seuil. Alexander, J., 2015. Perspectives on Place: Theory and Practice in Landscape Photography (Required Reading Range). Fairchild Books. This entry was posted in Assignment, Assignment 2, Uncategorized on August 24, 2018 by Leonard Scott.